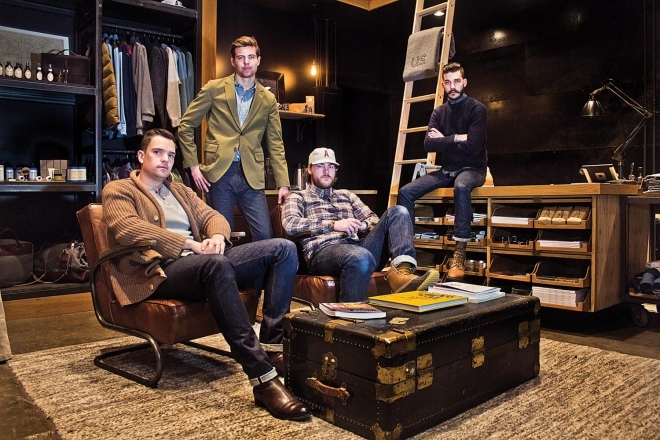 Located in historic Over-the-Rhine is the type of highly curated men’s clothing store previously unheard of in Cincinnati — one that would normally find its niche in a high-end fashion hotspot like New York City. Owner Anthony Graziani says that Article, a lifestyle blog turned shop, is for the classic man who possesses a sense of refinement and adventure. The brand’s style is rugged yet chic, casual yet upscale and traditional with a classic edge. It has a certain outdoorsy appeal but is likewise undeniably urbane. Graziani was inspired to take action when he noticed a gap in men’s fashion in Cincinnati. He felt that the retail here was subpar and that men were subjected to the small selection at the back of mall stores usually intended for women. Article succeeds at this, providing genuine merchandise, often locally made. The number one selling product, Noble Denim jeans, made with selvedge denim, are designed in Cincinnati and handcrafted from 100-percent handmade American components. It is hard to believe that the storefront has only been up and running for a few months with its impeccable display of diverse products: scarves by The Hill-Side (Brooklyn-based designers of handmade ties, scarves and handkerchiefs), wallets from leather and canvas design company Billy Kirk, outerwear from the socially conscious Apolis. The store is pet-friendly and sells merchandise such as Tanner Goods pet bowls and dog collars. It even sells beverages — locally made Deeper Roots coffee in two blends especially made for Article, and Juniper Ridge tea. Article began as a curated lifestyle blog on the website articlemenswear.com. The journal contains posts on local brands, such as the ones featured in the online store and storefront, as well as local people and trends. For instance, Graziani profiled Aaron Strasser, “bartender-in-chief at A Tavola, part-time model and all-around great guy,” and included the “Genuine Article” drink recipe Strasser makes, which contains smoked bourbon and rosemary. Article offers shoppers a space in which they can truly feel at home. Guests can relax with a periodical and complimentary beverage — there is occasionally even beer on tap.